Greece is a country of abundance when it comes to natural resources and organically produced goods. The various herbs, fruits, vegetables and livestock have made the Greek cuisine famous the world over. We are about to take a tour on the culinary map of Greece beginning with the top dishes to try anywhere in the country. Then we will move towards the gastronomic scene of its country side, its islands and different regions to savor their essence. So, are you ready for the most flavorsome journey of all times? 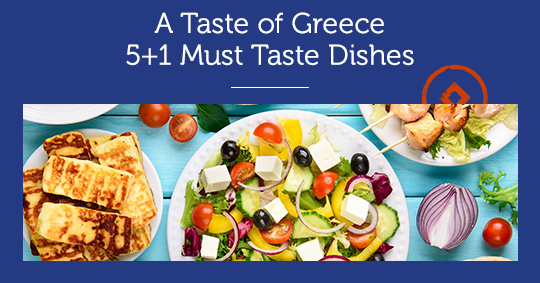 Here are 5+1 must taste dishes while in Greece. 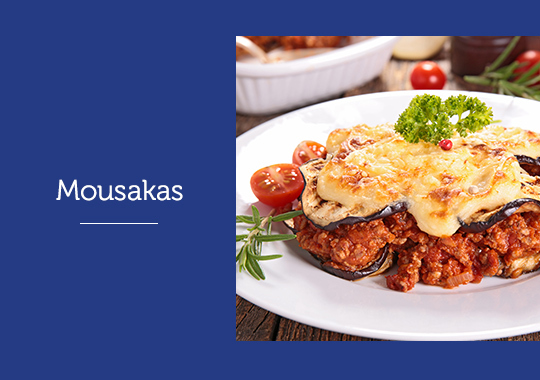 The first version of Mousaka, appeared in the Persian and Arabic cuisine but the legendary Greek Mousaka was introduced to the world in 1910 by the master chef Nikolaos Tselementes and since, every recipe book printed in Greece is also known as Tselementes. Mousakas is a baked dish of 4 layers. Sautéed potatoes, aubergines, minced meat and béchamel. The recipe also contains purred tomato, onion, garlic, spices, olive oil and cheese. You may find this dish in any Greek restaurant serving authentic Greek cuisine. 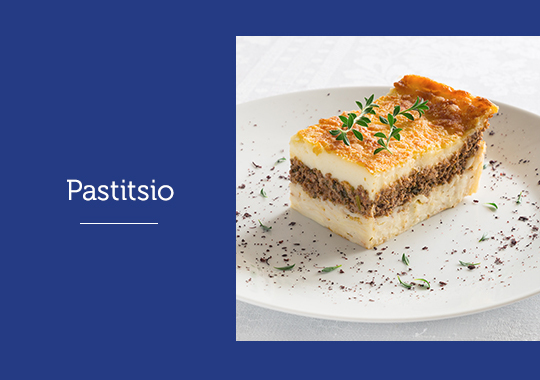 Another traditional dish of the Greek cuisine baked in layers is the well-known Pastitsio. The 3 layers are made of pasta, minced meat and béchamel. Other ingredients included in the recipe are, pureed tomato, nutmeg, cheese, spices and olive oil. 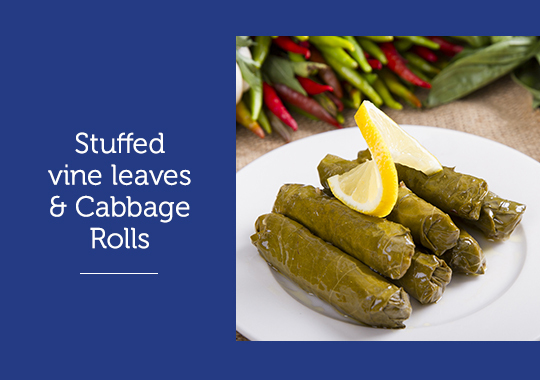 Vine leaves, stuffed with rice, spices and herbs, rolled in long spheres and boiled in layers. The winter variation of the stuffed vine leaves are the cabbage rolls, cabbage leaves stuffed with mince, rice and herbs and drizzled with lemon sauce. Of course we couldn’t leave out the ultimate favorite of all Greeks. Souvlaki! 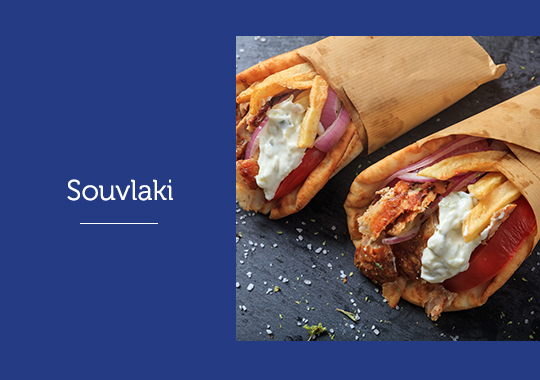 Pork or chicken pieces of meat grilled on a skewer and rolled in a pita bread with tzatziki, onions, tomatoes and French fries. There are many variations of souvlaki with gyro, kebab, sausage or lamb doner. 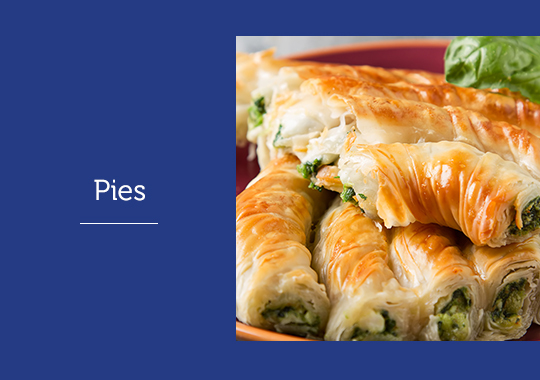 Greece is the land of pies, from savory cheese and spinach pies, to meat pies, wild green pies and vegetable pies to sweet pies such as pumpkin pies, apple pies and bougatsa. Being nestled in the Mediterranean, Greece could only offer the best and freshest fish and seafood there is. 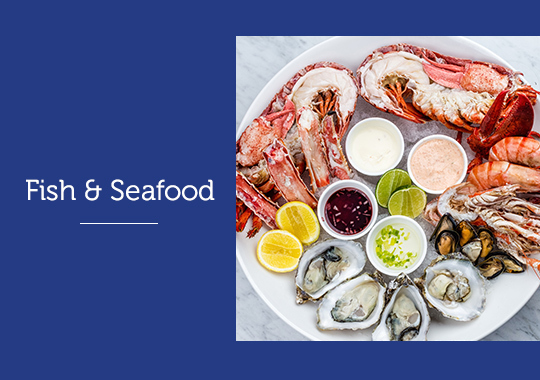 From squid, sardines, octopus, mackerel, lobster, shrimp, grouper, mussels, sea urchins, gray mullets, moray eel, anchovies and tuna to smoked herring and fish soups prepare to tickle your palates with the scents and flavors of the Greek seas. For all of you craving for more, stay tuned as the best 5 dishes of Crete will soon follow. This entry was posted in Cycladia Posts, Destinations, Gastronomy. Bookmark the permalink.